When comparing prices on lawn aerator rentals in Santa Cruz, San Jose and Campbell, ask about sales tax and environmental fees. Making holes in the surface of your lawn allows oxygen to the roots and soil allowing it to "breathe" it also helps to break up thatch and tight compacted soil is loosened up for deeper root growth. Our aerators extract a plug leaving a hole that allows water, and nutrients direct access to the roots. Tip: always rake up the plugs and then rake sand into the open holes. Not only will you have to aerate less often but it also stops bugs from infiltrating the holes. Side weights allow for improved ground penetration and are removable for reduced effort when lifting or for altering weight balance on slopes and inclines. 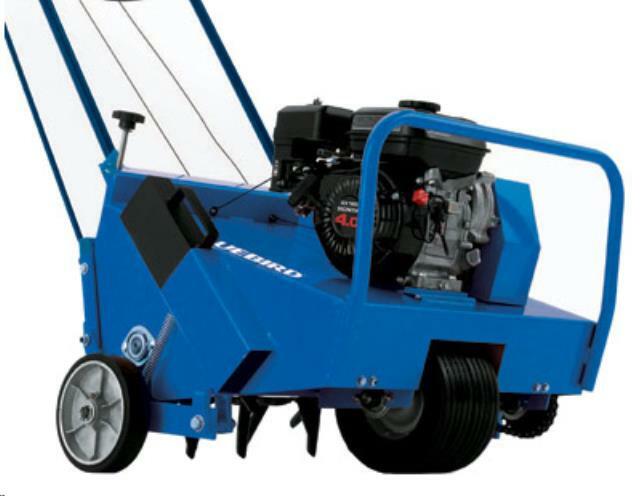 Coring depths up to 3"
Trailer Available At Special Rate When Rented With This Aerator. * Please call us for any questions on our lawn plugger aerator rentals in San Jose, Campbell, Salinas, Santa Cruz, Watsonville, Morgan Hill, Hollister, Santa Clara, Gilroy, Milpitas Sunnyvale, Fremont, Salinas, the Greater Bay Area and the Monterey Peninsula.